One page from W. Keith Dishman's The Dishman Family of Virginia web site. Graphics and other formatting by W. Keith Dishman. James Samuel Dishman was also known as Sam Dishman. He was born on 21 December 1885 in Prim, King George County, Virginia.1 He was the son of James William Dishman and Anna Edwards Suttle. James Samuel Dishman was listed as the head of household on the 1930 census in Shiloh District, King George County, Virginia. The household included his wife, Betty Bell, his son, William Kenneth and James Dallas, his daughter, Virginia Rae, Hazel Grigsby, Anna Carolyn and Betty 'Mae'.11 James Samuel Dishman was Sheriff of King George County, Virginia from 1 December 1942 to 31 December 1959. 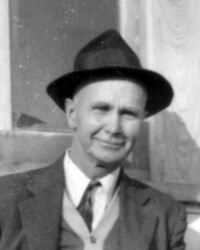 James Samuel Dishman died intestate at the home of his son, James Dallas Dishman, on 8 April 1979 in Campbell County, Virginia, at age 93.13,14 He was buried in Round Hill Church Cemetery, King George County, Virginia. [S3] James William Dishman family, Holy Bible (n.p. : n.pub., circa 1890); Original owned in 2001 by James Dallas Dishman, Lynchburg, Virginia. Hereinafter cited as James Wm. Dishman Family Bible. [S46] 1900 U.S. Federal Census (Population Schedule), King George County, Virginia, James W. Dishman household, ED 41, Sheet 10A, line 1, electronic image, (Online: Ancestry.com, Inc.,2002), Image 19 of 30, http://www.ancestry.com, subscription database, (Digital scan of original records in the National Archives, Washington, DC). [S47] 1910 U.S. Federal Census (Population Schedule), King George County, Virginia, ED#57, Shiloh District, Sheet 5B, Image 10, electronic image, (Online: Ancestry.com, Inc.,2002), http://www.ancestry.com, subscription database, (Digital scan of original records in the National Archives, Washington, DC). [S126] Obituary, The Daily Star, Fredericksburg, Virginia, 9 Nov 1912, p. 2, col. 3,Obituary dated 7 Nov 1912. [S143] James W. Dishman, Certificate of Death 11419 (9 Nov 1912), Department of Health, Bureau of Vital Records and Health Statistics, Richmond, Virginia. Hereinafter cited as Virginia Certificate of Death. [S16] James Samuel Dishman and Betty Grigsby marriage, 23 Nov 1916, County Clerk's Office, King George County, Virginia. Marriage License with Minister's Return. No citation of original book or page..
[S198] World War I Selective Service System Draft Registration Cards, 1917-1918; Virginia, King George County, Local Board (Code No. 45-1-22C); Record Group 163, National Archives and Records Administration - Southeast Region, East Point, Fulton County, Georgia, card of James Samuel Dishman, serial no. 435, order no. A406. Hereinafter cited as WWI Draft Cards. [S48] 1920 U.S. Federal Census (Population Schedule), King George County, Virginia, ED#60, Shiloh District, Sheet 1A, electronic image, (Online: Ancestry.com, Inc.,2002), http://www.ancestry.com, subscription database, (Digital scan of original records in the National Archives, Washington, DC). [S48] 1920 U.S. Federal Census (Population Schedule), King George County, Virginia, James S. Dishman household, ED#60, Shiloh District, Sheet 1A, electronic image, (Online: Ancestry.com, Inc.,2002), Image 1 of 20, http://www.ancestry.com, subscription database, (Digital scan of original records in the National Archives, Washington, DC). [S136] Anna E. Dishman will (1 Mar 1927), Will Book 5, page 442, County Clerk's Office, King George County, Virginia. [S49] 1930 U.S. Federal Census (Population Schedule), King George County, Virginia, Samuel J. Dishman household, ED 50-6, Sheet 4B, line 79, electronic image, (Online: Ancestry.com, Inc.,2003), Image 8 of 29, http://www.ancestry.com, subscription database, (Digital scan of original records in the National Archives, Washington, DC). [S103] Commonwealth of Virginia v. J. Samuel Dishman, Transcript of Trial Proceedings, King George County Circuit Court, May 29, 1954., Personal Papers of Keith Dishman, Alpharetta, Georgia. [S17] James Samuel Dishman, Certified Copy of Death Record, Registration Area Number 115, Certificate Number 24 (16 Apr 1979), Department of Health, Bureau of Vital Records and Health Statistics, Richmond, Virginia, Issued 18 Apr 1979, Campbell County, Virginia, Certificate Number 24. Hereinafter cited as J. S. Dishman Death Certificate. [S128] Obituary, The Free-Lance Star, Fredericksburg, Virginia, 9 Apr 1979, p. 12, col. 1. This page was created by John Cardinal's Second Site v1.5.0, then manually modified to include it in the Theme and Format Examples site.